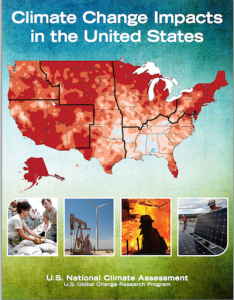 Findings from The Third National Climate Assessment Report (released in spring 2014) will be presented at the Ecological Society of America’s 2014 Annual Meeting in Sacramento, Cal., August 10–15. Two Ignite sessions focusing on findings in the United States National Climate Assesment5 (NCA) will take place on Monday, August 11th during the Ecological Society of America’s 99th Annual Meeting, held this year in Sacramento, California. The first session, Ignite 1: From Plains to Oceans to Islands: Regional Findings from the Third National Climate Assessment will highlight major findings from the report about the regional effects of climate change, discuss impacts to the ecosystems of the region, and explore how changes in those ecosystems can moderate or exacerbate the impacts of climate change when coupled with other socioeconomic and demographic shifts. Report authors will discuss key findings from each of the ten regions: Northeast, Southeast and Caribbean, Midwest, Great Plains, Northwest, Southwest, Alaska, Hawai‘i and U.S. Affiliated Pacific Islands, Coasts, and Oceans and Marine Resources. In the second session, Ignite 2: From Mountains to Coasts: Ecosystems in the Third National Climate Assessment major findings from the report about climate change’s effects on ecosystems and sectors of concern are presented. NCA authors will discuss the numerous impacts of climate change on ecosystems, including shifts in biodiversity and location of species, disruptions in ecosystem structures and functions, inability of ecosystems to adapt to change, and alterations to the capacity of ecosystems to moderate the consequences of disturbances. Ecosystems provide a rich array of benefits and services to humanity, including habitat for fish and wildlife, drinking water storage and filtration, fertile soils for growing crops, buffering against a range of stressors including climate change impacts, and aesthetic and cultural values. Because of the importance of ecosystems to humanity, climate change impacts will affect the fisheries, drinking water, air quality, croplands, and iconic species and landscapes that support jobs, economic growth, health, and human well-being. The NCA collects, integrates, and assesses observations and research from around the country, helping to show how the climate is changing and what it means for the communities, states, and regions in which we live. The NCA report is the most comprehensive assessment of climate change science, impacts, and responses in the United States to date. It analyzes the current and future impacts of climate change the United States and summarizes key risks and opportunities for each of ten regions. Evidence for climate change abounds, from the top of the atmosphere to the depths of the oceans. Scientists and engineers from around the world have meticulously collected this evidence, using satellites and networks of weather balloons, thermometers, buoys, and other observing systems. Evidence of climate change is also visible in the observed and measured changes in location and behavior of species and functioning of ecosystems. Taken together, this evidence tells an unambiguous story: the planet is warming, and over the last half century, this warming has been driven primarily by human activity. U.S. average temperature has increased by 1.3°F to 1.9°F since 1895, and most of this increase has occurred since 1970. Temperatures are projected to rise another 2°F to 4°F in most areas of the United States over the next few decades. The magnitude of climate change beyond the next few decades depends primarily on the amount of heat-trapping gases emitted globally, and how sensitive the Earth’s climate is to those emissions. Ecological Society of America’s 99th Annual Meeting, August 10–15th, 2014, in Sacramento, Cal. Scientific assessments like The National Climate Assessment report are essential tools for linking science and decision making. It is used by the U.S. Government, citizens, communities, and businesses as they create more sustainable and environmentally sound plans for the future. Credit, USGCRP. This entry was posted in Press Release and tagged annual meeting, climate change, ESA2014, NCA by Alison Mize. Bookmark the permalink.